Victor Aviation has a "one-of-a-kind", state-of-the-art engine test apparatus (nicknamed "Big Red") that measures and records all engine operating parameters with the propeller installed. Engine real-time thrust velocity and vibration spectrum outputs are documented without installing a water brake dynamometer on the engine. This is a much higher technology- advanced engine testing procedure than are typically found at other facilities where water brake "dynamometers" are used as our testing process puts a thrust load on the engine while in test. Testing an engine with the aircraft propeller installed insures that the engine testing will provide as accurate information as possible to simulate what power will actually be produced with the thrust force of the propeller applied to the engine. This is a mobile apparatus (MTA) designed to run engines at full load with the actual propeller and accessories installed. The complete engine test run process typically requires an average of two workdays for most engines. Extended engine test running is available upon request of the aircraft owner. The MTA was created by Victor Sloan with the mentoring and engineering guidance of former X-15 Rocket Pilot and Propulsion Engineer Scott Crossfield. No other company in the world takes such extreme measures to insure proper quality control. The engine is first prepared with specially prepared flouresant dyes in the oil system and loaded into a hydraulically operated engine mounting structure that compresses forward to measure propeller thrust during engine testing. This thrust force is electronically measured using an electronic load cell wafer at the engine mount and sends this data to a recorder in the cockpit of the test apparatus. 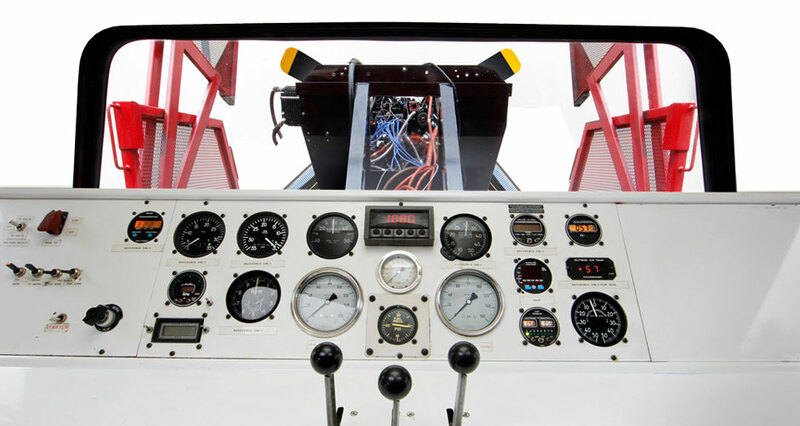 Information provided as a result of this test procedure gives the engine test operator a true reading of what the engine and propeller combination is producing in real-time engine test conditions at all engine RPM's and manifold pressures. During the engine test cool down periods the engine is placed under a canopy to examine the engine for any detection of the fluorescent dye from the engine oil system using a black light. Should the operator discover any fluorescent dye indications this would indicate that an oil leak has occurred. When an engine leaves Victor Aviation you can rest assured that your engine has been tested and examined to the highest level of quality and ready for installation into your aircraft. Simultaneously during engine test running, internal engine vibration harmonics are measured to determine the vibration amplitudes of rotating engine parts at their various frequencies. The internal moving parts of the engine can be identified by their individual frequency recorded on a full-domain spectrum analyzer and the amplitude of frequencies (or vibration level) can be compared to stored reference data to assure that all internal engine parts are in perfect operation. These types of engine test procedures are typically only found in turbine engine testing facilities, although only at Victor Aviation will you find such advanced engine test procedures in place in the piston engine industry.